A rich BBQ tomato sauce encasing oodles of tender cannellini beans and sweet cherry tomatoes lovingly ladled over crusty sourdough toast. Healthy comfort food at its finest! Vegan, GF & healthy. Heat the oil over a medium heat in a large saucepan and add the onion. Fry for 5-10 minutes or until translucent and soft. Then add the garlic, tomato puree, mustard, paprika, maple syrup, soy sauce/tamari and plum/cherry tomatoes. Give everything a good stir and continue to cook for 2 minutes or so until combined. Add the beans and passata into the pan, stir and bring to the boil. Reduce the heat to low and simmer for 5-8 minutes until the sauce has thickened slightly. Taste and season with salt and pepper. 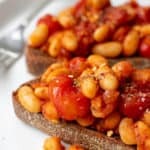 To serve, generously spoon the beans over the toasted bread and top with a sprinkling of black pepper and a few chopped herbs. Any leftovers can be kept in an airtight container in the fridge for up to 4 days. Reheat thoroughly before serving. The smoked paprika in this recipe gives the beans a lovely BBQ flavour. If you aren't a BBQ fan you can use regular paprika instead. These beans don't just need to be served on toast! They are great on a jacket potato, as part of a full english breakfast or to serve with your weeknight supper. Gluten-Free: Use a GF bread and tamari rather than soy sauce. Try to find a wholegrain mustard made without added sugar, sulphites or other preservatives. I love this one. Try to use 100% maple syrup and not maple ‘flavoured’ syrup. You could also use agave nectar or raw honey if you prefer. Watch out for any added sugars, preservatives or E-numbers in your tamari or soy sauce. The ingredient list should be very short and simple.